Join the discussion on our forums! 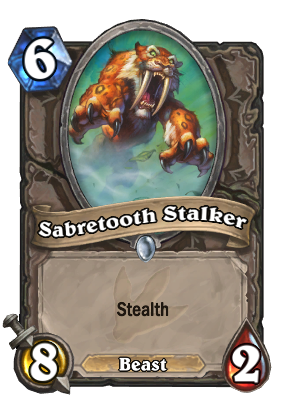 Come discuss Sabretooth Stalker over in our dedicated Sabretooth Stalker discussion topic. +1 Mana for +3/-3 on a Stranglethorn Tiger... No thanks. You could set up some weird OTK druid with the warden (or whoever it was that summons a copy of a beast) or something. ... this video is being very useful today. Yeah, definitely. But as filler goes, this is pretty cool. Beats Worgen Greaser and Backstreet Leper, at least. since Ravenholm Assassin isn't played in stealthy buff decks I don't think this will....I mean, it's a lot easier to remove a 2 health stealthed minion than a 5 health one. "hope u put a consec in ur deck scrub"
Until Sloth is released, we can pretend that Weasel Tunneler is one. No, That guy is obviously the Eye patch dude from Ice Age 3, looks at his face! I don't get why you got down voted. It actually has a turn 7(6 coined) setup for Shamans. A 3 card 20 damage(or 22 damage) setup, or 4 cards OTK setup. Not the safest of plays, but still as you said it. Possible. Very scary card in Arena. Not really the best card to use in Constructed though.